Last week I mentioned that I am often approached with questions on the Laws of the Game. Fortunately, I usually have an answer but a phone call a few weeks ago from David Downs, the Reading FC historian, who Reading Post readers will know from his column Ask David Downs, had meflummoxed. Let’s go back to Saturday 22nd December when an unusual but not unique incident occurred at the Huddersfield Vs Sheffield Wednesday match. The referee, Mick Russell showed a yellow card to the same player twice but failed to send him off as the Laws require for two cautionable offences. It also happened to Graham Poll at the 2006 World Cup despite at these levels, referees having colleagues to assist them. At the time of Graham Poll’s slip-up, the Laws stated that the Fourth Official must indicate to the referee, when a player is not sent off after receiving a second yellow card. In 2010, that and other specific duties were taken out of the laws and replaced with ‘He assists the referee to control the match in accordance with the Laws of the Game’. He is still expected however to advise the referee should this situation occur. 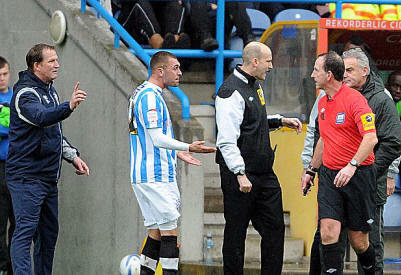 The fourth official at Huddersfield obviously didn’t remind Mick Russell that he should have brandished the red card. One of David Downs’ questions was that if he had managed to attract the referee’s attention after play had restarted, could he have then dismissed the player? Similarly, the newspapers reported that the Huddersfield manager took it up at half time with the referee. Could he then have refused to allow the errant player to take part in the second half, or does the Law that the referee can’t change his mind after play has recommenced, apply here as well? If not, it raises the question that if, between the two yellow cards and the referee’s realisation of his mistake, the guilty player’s team scored a goal, would it be allowed to stand? I raise this is because there is a clause in the Laws regarding the referee finding a team has an extra player. This is really when a team is discovered to have twelve players. The Law says that if a goal is scored and the referee then realises this before the game restarts, the goal will be disallowed if scored by the team with the extra player. If the goal is against them it would be allowed to stand. So many questions that I decided to take them to the top, Neale Barry, who is the FA’s representative on the International FA Board, the body responsible for the Laws. To my delight I found out that I was not the only one in a quandary. Talking to Ray Olivier, Training and Development Manager for the Select referees who are in charge of Premier League games, I discovered that they had also posed questions on this topic to Neale. So what has been Neale’s reply? “We are currently having this debate,” he told me. “As the law stands, once the game has restarted the player can’t be dismissed even if the referee is informed of his mistake. Some feel this should remain, which avoids pressure from managers, media etc, and any fallout can be dealt with by the appropriate competition. Others feel that morally and for the integrity of the game, the referee should be allowed to dismiss the player even if he is told after play has restarted. The jury is still out but we must remember in all this, that the referee’s decision is final on all points of law. Not a clear outcome” says Neale “but that’s where we have got to”. I don’t feel so bad now that I couldn’t answer David’s questions right away.